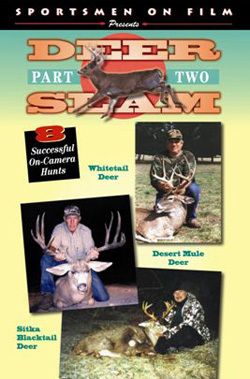 The six largest and most commonly hunted deer species in North America are Coues Deer and Whitetail, Columbia Blacktail and Sitka Blacktail, and Rocky Mountain Mule Deer and Desert Mule Deer.Deer Slam: Part Two documents the hunting for Whitetail Deer, Sitka Blacktail Deer, and Desert Mule Deer. A Sportsmen on Film DVD production. The six largest and most commonly hunted deer species in North America are Coues Deer and Whitetail, Columbia Blacktail and Sitka Blacktail, and Rocky Mountain Mule Deer and Desert Mule Deer.Deer Slam: Part Two documents the hunting for Whitetail Deer, Sitka Blacktail Deer, and Desert Mule Deer.Whitetail Deer are the most numerous and widely distributed big game animal in North America. Bill Holloway shoots a 13 pointer and his son, B.J. bow hunts a 20-inch wide buck and rifle hunts a 12 pointer with lots of trash. Then William "Smitty" Smith shoots his best Whitetail ever and his son, Bill shoots his first Whitetail ever. All hunts are guided by Larry Grimland of Whitetail Ranch.Sitka Black tail Deer occur in coastal regions and islands of Alaska and British Columbia. They are smaller that Columbia Blacktail with shorter legs. Ken Wilson hunts two excellent specimens with Roy and Shannon Randall of Afognak Wilderness Lodge.Desert Mule Deer inhabit parts of the southwestern U.S. and northwestern Mexico, Jim Pollard and Luis Canal walk-up to their huge bucks, and Ken Wilson hunts his by tracking with Carlos Gonzalez Hermosillo of Big Game Outfitters - Mexico.